(i) The number of zeroes is 0 because the graph does not intersect x-axis at any point. (ii) The number of zeroes is 1 because the graph intersects x-axis at only 1 point. (iii) The number of zeroes is 3 as the graph intersects x-axis at 3 points. (iv) The number of zeroes is 2 as the graph intersects x-axis at 2 points. (v) The number of zeroes is 4 as the graph intersects x-axis at 4 points. 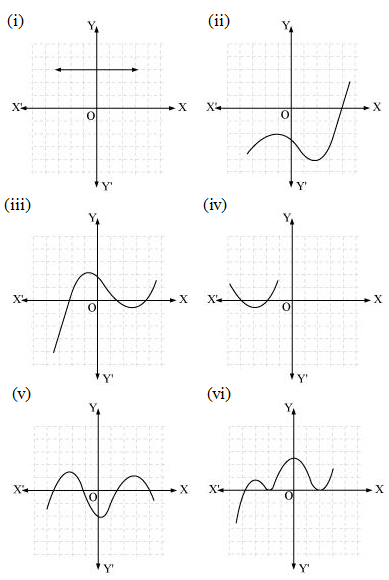 (vi) The number of zeroes is 3 as the graph cuts x-axis at 3 points.